The latest sensation taking over media outlets is a campaign started by Girl Scouts of America CEO Anna Maria Chavez and LeanIn.org Founder Sheryl Sandberg. 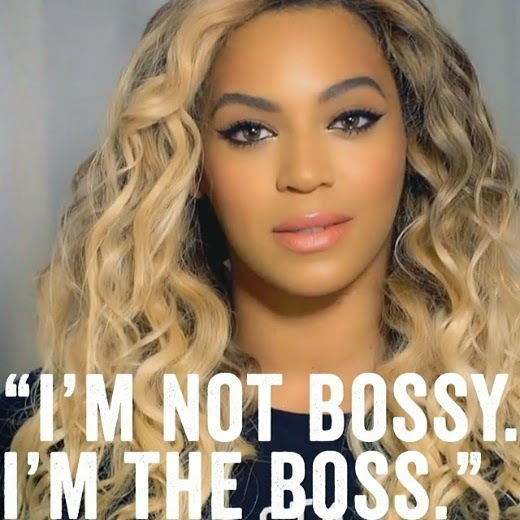 The video campaign, which can be found on YouTube, features influential women such as Condoleezza Rice, Jennifer Garner, Jane Lynch, Diane Von Furstenberg and Beyonce in a ploy to ban the word "bossy." These women are proclaiming that being labeled matters. They’re proclaiming that words matter and can be interpreted to limit young girls’ potential rather than encourage it. The purpose of this message is to change the culture in leadership by raising girls’ self-esteem and inspire them to seek leadership roles. While the effort is commendable, to identify the term "bossy" as the sole cause of the lack of women in leadership roles—as the campaign promotes—is implausible. Indeed, it’s a positive message for young girls but a valuable lesson for women in business. As a promising entrepreneur, the word bossy doesn't make me feel subservient. In fact, it empowers me to believe that I have the courage and the ability to be an effective leader. When we consider Kevin Kruse’s definition of leadership—a process of social influence, which maximizes the efforts of others—toward the achievement of a goal, we can shed an alternative and more positive light on the word “bossy” and its role in leadership. Leadership doesn't stem from authority or power but the ability to inspire the best in everyone for a common goal. The notion that a bossy woman cannot be an effective leader devalues a strong and assertive leadership style. The word bossy may be defined as authoritative and demanding, but these are attributes that girls and women should pursue and not shy away from. We live in a society that prides itself on achievement and success. In order for women to succeed in business or as entrepreneurs, we must be able to stand strong with the self-confidence and ambition to lead. There are many women who we can assume had to embrace being labeled "bossy" in order to move up the C-Suite ladder and become actual bosses in corporate America. Several successful women today have had to embrace their inner boss to achieve corporate goals or to start successful companies. We can learn valuable lessons from women such as Ursula Burns, Chairman and Chief Executive Officer of Xerox, a $23 billion dollar company. Burns has stated that taking risks was the break or make point in her career, and she now comes to appreciate and really value the other attributes that define a company's success beyond P&L (profit and loss): great leadership, long term financial strength, ethical business practices, evolving business strategies, sound governance, powerful brands and value-based decision making. Burns has set a path that we can all learn from and implement to move up the corporate ladder. Another woman who we can learn from, who accepted bossy-like attributes to become the boss is Oprah Winfrey. One of the best lessons we can learn from Oprah is the belief in one’s self and following your instincts. She didn't accept that she was a woman in a male-dominated entertainment industry. She decided that she would follow her instincts and take risks, which led her to become one of the most powerful women in entertainment. An incredible lesson that should inspire entrepreneurs to take risks, stand up for your vision and be the boss you were called to be! In closing, there are positive and negative connotations associated with being labeled “bossy,” but young girls and women should embrace the positive ones. These include self-confident, ambitious, determined and risk-taker. Women should be empowered to create the lives they want to live without being stigmatized for being assertive in their quest for success. Instead of banning the word “bossy,” we should embrace what being bossy really stands for—taking charge, taking risks, speaking our minds and being strong, all of which are necessary qualities for being an effective leader. Being bossy means being authentic in a way that empowers others to greatness and not to degradation. I choose to embrace the positive definition of the label “bossy” while conducting myself as a BOSS—a woman destined to be great, leading by example and making a difference!